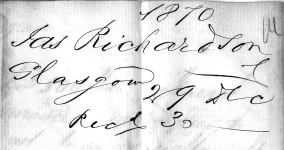 Dated 30 July 1830, Percival informs Sir Henry that Mr Mahon is shipping on the 'Everton' to sail throughout June a total of 73 hogsheads of sugars, 40 barrel of sugar and 60 puncheons of rum. He then talks of wasting no time in selling the consignment recently arrived on the 'Clarendon' as he has some concerns over the future market, however the sugars were well manufactured and the rums were of good strength and colour but slightly wanting in flavour. Below are the weights and prices of the sugars, but although Percival only took 2½% commission, after a huge 40% customs duty and sundry other mostly shipping-related charges, Sir Henry only received �3 from the original �71 sale price !! write that you approve of this. early to be done with it. to be better in one the division can be taken down. is anything wrong, the half falls on you. I am arranging about it. heated before it is run into the blow ups. goods spoiled. Could you try this. any molasses having sold and debited(?) 20 punch @ 20/9. It will only be a few puncheons. were good, but have other parcels on board. much good, but wil pay a small gain on cost. I have a loaf at 77/6 equal to yours at 8?/? and was sold by S Wilson. 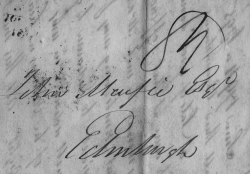 William Macfie - died 1854 - Robert Macfie & Sons, Greenock. Younger brother John - died 1852 - Macfie's, Canongate, Edinburgh. Sederunt Book refers to a family trust maybe arising from a marriage contract, a bankruptcy or a personal incapacity. afraid you would scarcely make out my hand. Letter of last night with the copy of Mr Atherton's. house too, I should not wonder if he did. to take a charge or preparing for it. @ 23/6. I could buy to earn at that, append 22/9. place for John. She will advance in my scheme we propose. pleased to go if thought right. All this must be mine. arrived, the accounts are favourable in regard to crops, good. error in taking some more in at their rates and will say so to him. I think we have about as many sugars as you. then write him particularly about Mr Grant, say. with some discount of which advise them. Fairrie's - friends and competitors in both Greenock & Liverpool. and some treacle, and com crushed, perhaps candy. It was 30/4½. I refused the treacle. mixing & it is well Robert has wrote as he did. We are attending to the order for Messrs. Couburgh & Co.
Brown was here to day. I believe he is looking out. will require a good boiler. hesitate to advance at 4m/d. The Wm Nichol was to leave London middle of last week. on account of the absence of Robert. I enclose the account of goods for __. Robert - the son of William - Liverpool - married daughter of James Fairrie - died 1899.
an outline of our travels. with them, as I don't think there is much chance. interest of 1/3 or 1/4 and to provide the funds. are selling all they can. hitherto, had no notice taken of his communication. security we can get against it. both of which I have shown to Mr Sword and Mr Currie. will be made aware of the result. or have been relieved by Mr Taylerson's entry. 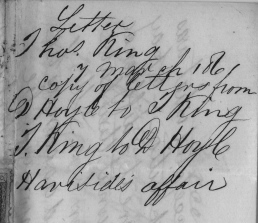 Thomas King was primarily a writer (notary) working at 2 Watt Place, Greenock. He was also secretary to Greenock Chamber of Trade, Secretary to Local Marine Board, a substitute at the Sheriff Court and longroom clerk at the Custom House. Duncan Hoyle was a partner at Hoyle, Martin & Co sugar refiners at 29 Sugarhouse Lane, Greenock. Duncan A Campbell was a partner in both Hoyle, Martin & Co and the Greenock Distillery Co. 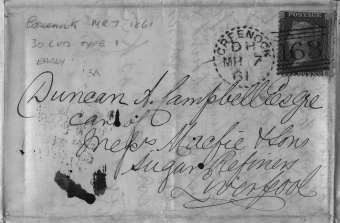 Being on his travels, King sent the letter c/o Macfie's, Liverpool, having initially thought to send it c/o Volunteer Service Club, London. Mr Currie was Alexander Currie the active manager of Hoyle, Martin & Co.
Mr Sword was Archibald Sword, a Greenock wine & spirit merchant who would become a sugar refiner within a couple of years. I'm afraid that as yet I've no further info on the Haviside affair, though as feu duty (ground rent) is mentioned it would suggest some form of property/land deal. the 'Clara' for 300 tons of Anne's. your way to do c f & i at 25/-. Letter ... Original letter (Ebay - Outbid) written by Henry Tate to solicitors Longueville, Jones & Williams of Oswestry, 1873. ... regarding the purchase of land and buildings in Liver Mill Place and Chisenhale St, Liverpool, from Thomas Irven. Tate instructs the same solicitor as Irven, and states he will go to Oswestry to sign the papers when they are ready. 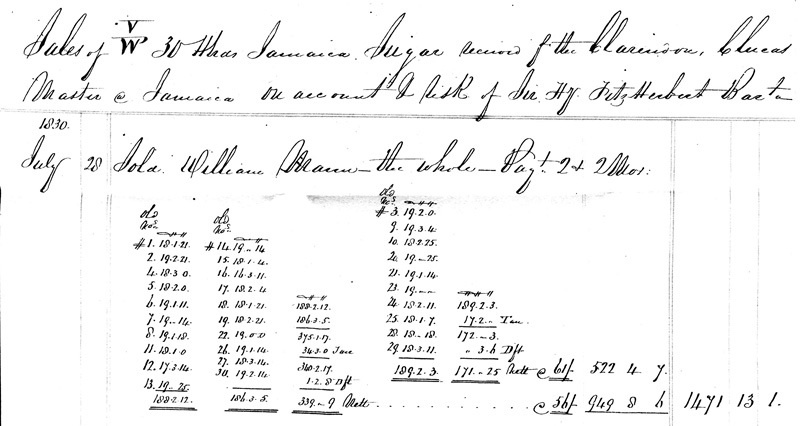 Dated 27 January 1873. This was a small parcel of land adjacent to the new Love Lane refinery, trapped between Liver Mill Place and Chisenhale St and the canal and Irven's factory. J A Watson in 'A Hundred Years of Sugar Refining' described how it was used ... "There were two lime kilns on the strip of land between Irven's lard works and the canal bank and part of the same site was occupied by the limestone yard which adjoined Chisenhale Street. Also sited there were the vacuum pumps, the cooperage and joiners' shop, a smithy, a circular saw, and other buildings containing stores of various kinds." This letter would certainly have helped Watson with the puzzle he had dating the development of the refinery. Letterhead ... of a Manchester refinery, with signature of one of the partners - Joseph B Forster - dated 1876. This particular partnership running the Chester St refinery began in 1861. Those involved were Alfred Fryer - born Rastrick, Davis Benson - born Preston, ten years older than Fryer and had previously managed a cotton mill, and Joseph Binyon Forster - a Liverpool born Quaker and a similar age to Fryer. Benson lived in Manchester, the other two in Cheshire. The refinery ceased production soon after the 1876 date of this letterhead. All Images 〣ryan Mawer 2014-15.